娄元林, 陈武, 杨桃. 西藏隆子县邦卓玛金矿床成矿模式与找矿模型[J]. 地质通报, 2019, 38(2-3): 449-461. 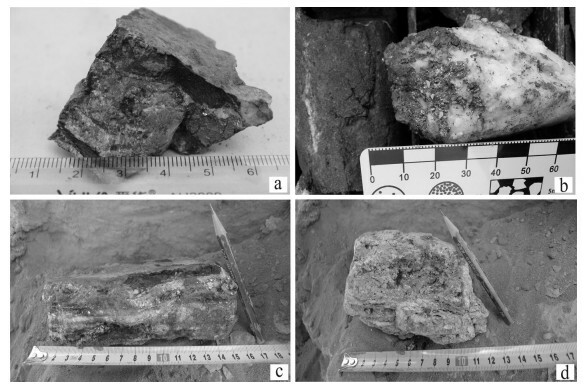 Lou Y L, Chen W, Yang T. Metallogenic model and prospecting pattern of the Bangzhuoma gold deposit in Longzi County, Tibet[J]. 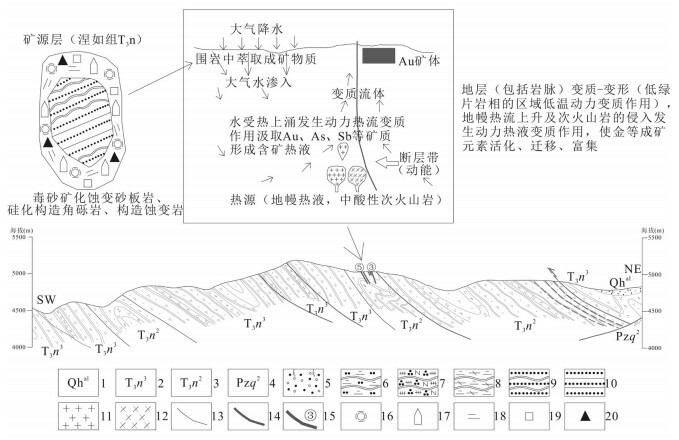 Geological Bulletin of China, 2019, 38(2-3): 449-461. Abstract: The Bangzhuoma gold deposit is one of the most potential deposit for prospecting in Gangdise-Himalaya Au-Sb polymetallic metallogenic belt of southern Tibet. 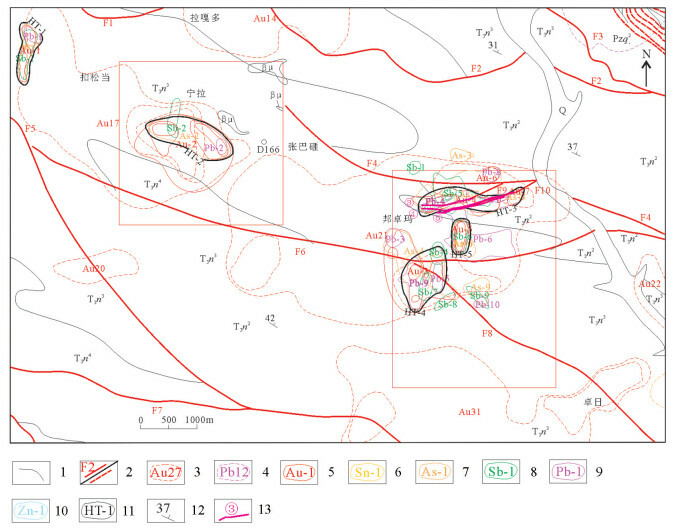 The analysis and study of the genesis and metallogenic model of the Bangzhuoma gold deposit have important guiding and reference significance for defining the mineralization type and carrying out the further oreprospecting work. 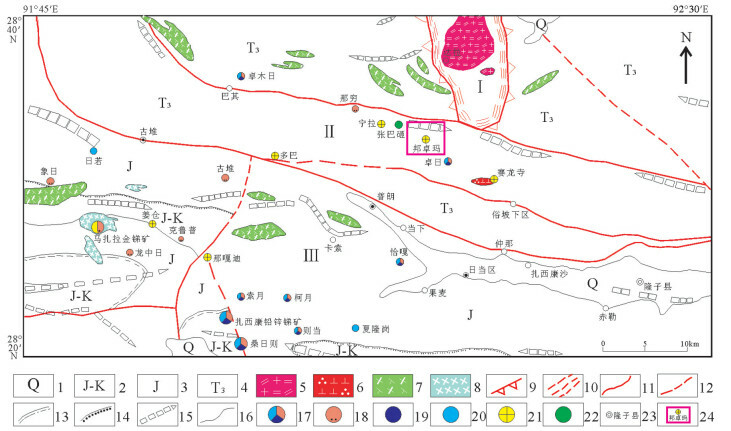 After collecting the geological data of the Bangzhuoma gold deposit, such as ore-forming tectonic background, regional strata, geological structure and igneous rocks, the authors analyzed geochemical characteristics and ore-bearing potential of the host strata and igneous rocks in this area. The results show that the Upper Triassic strata seem to have been its host rocks which might have provided initial ore source, and the medium-basic intrusive rocks of Early Cretaceous and the acid intrusive rocks of Neogene provided thermal energy, kinetic energy and some ore-forming materials. In addition, the ore-controlling factors and ore deposit genesis of the deposit were analyzed systemically in the aspects of strata, magmatic rocks, structure and H-O-S-Pb isotopes. Five orebodies were delineated preliminarily, and the sources of ore-forming materials and fluids were revealed. 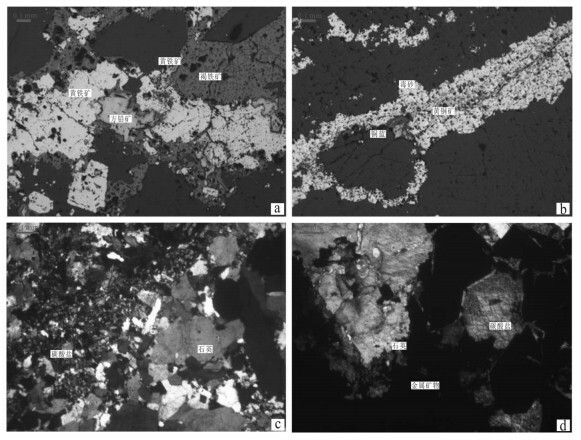 Based on the results obtained, the authors hold that the Bangzhuoma gold deposit bears low temperature shallow-seated hydrothermal features. The metallogenic model and prospecting pattern of this ore deposit were established on the basis of the above-mentioned study. 郑有业, 刘敏院, 孙祥, 等. 西藏扎西康锑多金属矿床类型、发现过程及意义[J]. 地球科学(中国地质大学学报), 2012, 37(5): 1003-1014. 王军, 张均, 郑有业. 西藏南部马扎拉金锑矿成矿规律初探[J]. 黄金科学技术, 2001, 9(4): 5-11. 王军, 张均. 西藏南部马扎拉金锑矿成矿特征及找矿方向[J]. 黄金地质, 2001, 7(3): 15-20. 张建芳, 郑有业, 张刚阳, 等. 西藏北喜马拉雅马扎拉金锑矿床地质特征及成矿作用[J]. 黄金, 2011, 1: 20-24. 郑有业, 多吉, 马国桃, 等. 藏南查拉普岩金矿床特征、发现及时代约束[J]. 地球科学(中国地质大学学报), 2007, 32(2): 185-193. 周天成, 孙祥, 郑有业, 等. 藏南查拉普金矿床载金矿物特征与金的赋存状态[J]. 矿床地质, 2015, 34(3): 521-532. 董富权, 胡可卫, 李武毅, 等. 西藏隆子县恰嘎村辉锑矿地质特征及找矿潜力[J]. 地质找矿论丛, 2015, 30(1): 98-102. 陈东太, 陈武, 胡可卫, 等. 西藏隆子县邦卓玛金矿床地质特征及地球化学异常特征[J]. 黄金, 2016, 37(8): 25-28. 陈永清, 卢映祥, 夏庆霖, 等. 云南保山核桃坪铅锌矿床地球化学特征及其成矿模式与找矿模型[J]. 中国地质, 2015, 32(1): 90-99. 任冲, 刘顺, 朱利东, 等. 藏南哲古基性岩SHRIMP锆石U-Pb年龄及地质意义[J]. 四川地质学报, 2014, 34(4): 881-890. 赵志新, 杨宝荣, 陈冬, 等. 西天山哈尔嘎嘎林恩铜金矿床地质特征及综合找矿模型[J]. 地质科技情报, 2015, 34(4): 84-91.